Welcome to the Early Identification Program (EIP), a division of the Office of Minority Affairs & Diversity. You have made an important first step in advancing your academic career at the University of Washington (UW) by visiting us. EIP is designed to enhance the probability of undergraduate student’s finding financial resources for, and being admitted into graduate school programs. EIP provides an array of graduate support services, including prospective graduate school advising, assistance with undergraduate research, and providing workshops, seminars, and social activities. 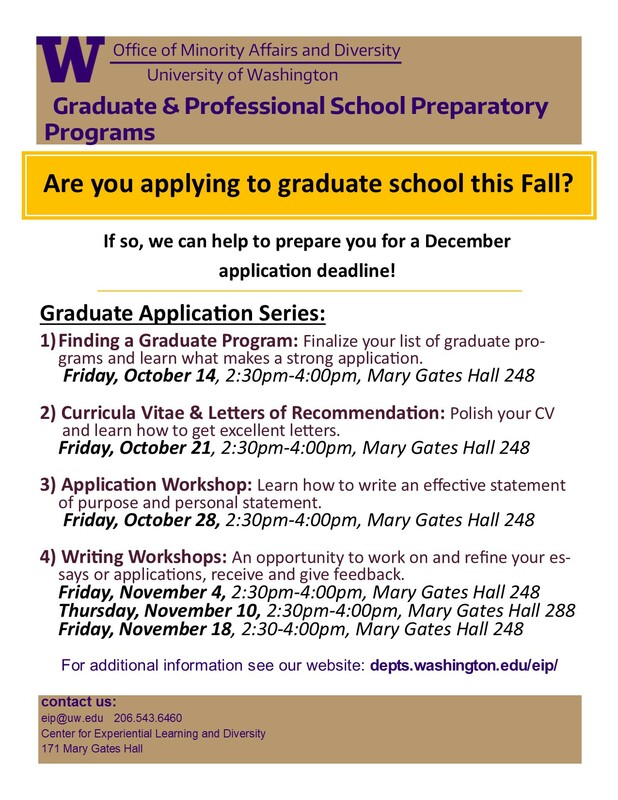 Are you a UW student considering the idea of graduate school? If so, we encourage you to affiliate with our program. To affiliate, it’s as easy as making an appointment with one of our advisers! The writing workshops are meant to be interactive. Bring your laptops, written notes or anything you have worked on relating to graduate school applications. You will not only get feedback from the instructor but feedback from peers as well. We accept appointments between 9 am - 4 pm, Monday through Friday. If you want to meet with one of our advisers, please e-mail our office to set up an appointment.